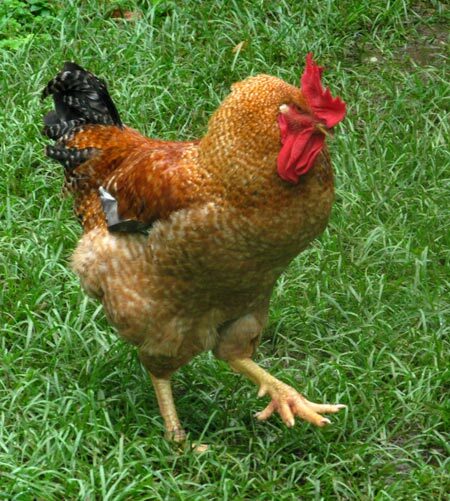 Malone the giant rooster struts through grass. 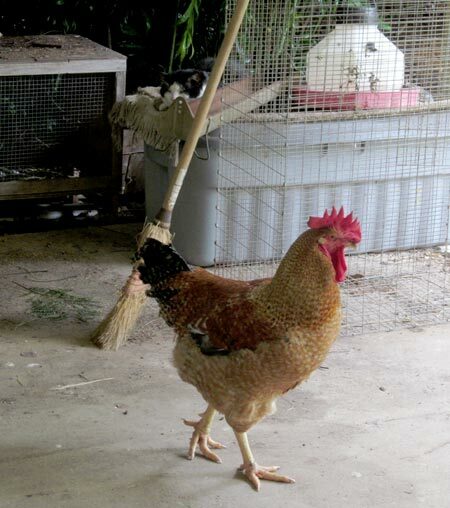 Meet Malone, the free-range young rooster who has been hanging around at Bee Heaven. He is huge, and has big feet, a big appetite, and big poops. Originally his name was a slang word in Spanish that sounds like Malone, that means big — never mind. 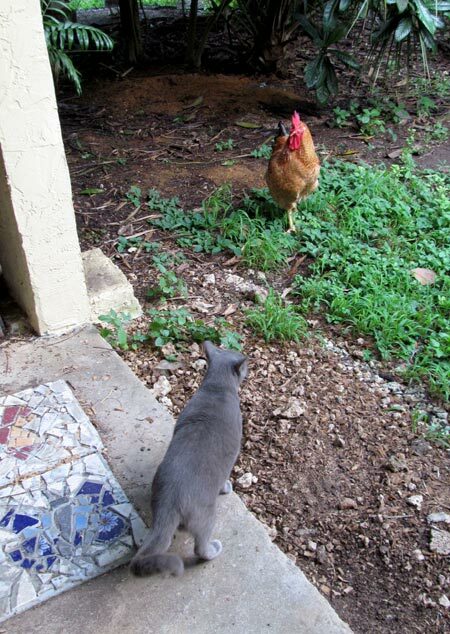 Malone on a mission to seek out dry cat food, while Flash the cat drowses nearby. Malone showed up several months ago, a refugee from South Miami, where roosters are not wanted. You can have fowl, but not foul mouth fowl. He hails from a farm in Jasper, Georgia, where he was bought as a tiny golden yellow fluffball chick an year ago. Surprise surprise, he quickly grew to ginormous proportions. Nobody knows what kind of breed he is. Greyling the cat having a few words about Malone’s greedy ways. Malone started hanging out near the farmhouse carport. He quickly discovered the gourmet delicacy of dried cat food meant for outdoor cats, and also learned the sound of pellets hitting metal bowls means yummy nom noms are served. He comes racing out of the bushes, making a dash for the dish. The cats step aside. After all, he outweighs them by a kilo or two. The only way the cats can eat is if their food is put out after dark, when Malone goes to sleep. Nobody knows where he roosts. Malone roams around the farm, free as a bird. 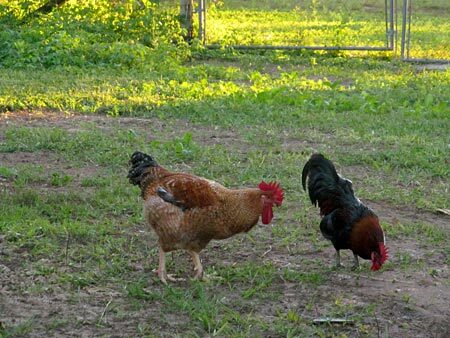 He started hanging out with Crazy Chicken, another free-range rooster, and they saunter around the farm, scratching for bugs and chatting up hens in the chicken tractors.